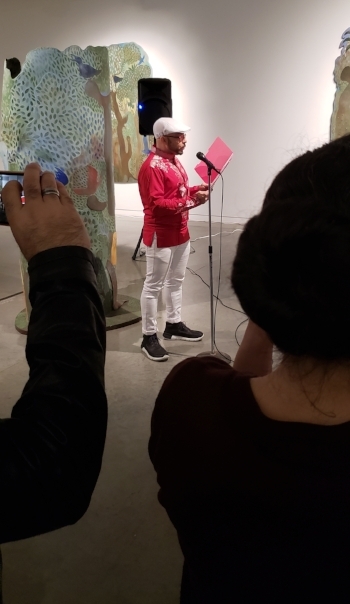 The Bronx Museum invited myself and the students from PS 73 read their praise poem as part of the closing ceremony of the Manuel Mendive exhibit. During and after the ceremony the poem was displayed on the museum floor in the midst of Mendive’s work. It was touching watching people pass by, read the poem, and interact with the content. Some laughing at the sillier answers, others nodding in consent as a word resonated. Large, mural poem is load out on a concrete gray exhibit floor. The mural poem itself is colorful, with white letters popping out through greens, purples, reds, blues, and yellows, to form words. The angle of the photo makes it difficult to see the start of the poem, though the lower words “ And running / playing/ minecraft / call of duty/ PS4/ and fun” are visible. In the background is the Manuel Mendive exhibit full of natural imagery with trees, leaves, roots, birds, jungle like plants, and human figures all visible in blues, greens, red, yellows, and browns. To the right is one of Mendive’s ladders also featuring the nature themes in smaller detail along the side and on the steps. The ceremony itself didn’t last too long, but it was quite a powerful showcase. Poet Orlando Ferrand read his praise poem he wrote to Manuel Mendive over the beat of Roman Diaz and his supporting drummers. This had been the basis for both the rhythmic and thematic work I had been doing with PS 73 throughout the Fall partnership, so being there in person to hear a live rendition was a wonderful experience. Afro-Cuban Poet Orlando Ferrand reads into a microphone from a red folder. He is wearing all white beret, glasses, a red shirt, white pants and black sneakers. In the foreground are audience members holding phones up to film and take pictures. The background is the Mendvie exhibit. No single piece of art is all in frame, but the nature elements of Mendive are clear with trees, leaves, roots, birds, jungle like plants, and human figures all visible in blues, greens, red, yellows, and browns. Two afro-cuban men play drums. The one on the left is younger and bit cut off by the frame. On the right is Roman Diaz, he is an older man, wearing a black berret, sunglasses, a red shirt and a black blazer. His large drum is horizontal across his lap and covered in a decorative blue, white and gold cloth. In the foreground are audience members, one holding up a phone to film. In the background is artwork by Manuel Mendive on a white museum wall. The art has a jungle like scene where humanoid figures are sitting on, around, and underneath a tree. 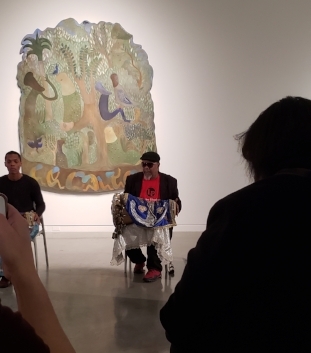 Check out these studio recordings of the praise poem on the Bronx Museum’s Soundcloud to get a sense for the reading. In the large exhibit space though Ferrand’s voice and Diaz’s rhythm carried, making it an almost mystic experience, as if the audience was wrapped up in an incantation. A final spell from Maestro Manuel Mendive. Also, the students and I made the flyer! We had our names in the interior copy and this great photo of our poem on the back. Big time stuff! Small paper flyer on a white table. The flyer has a photograph of the large, mural, praise poem in situ at the school against a brick wall with other art projects surrounding it. Below the photo is a description of the Bronx Museum, it’s social media content, and the funders/donors.